Problem: As a shopper looking for a car it is difficult to understand what vehicle and/or which trim has the features and options, they find most valuable. Solution: Make it easier for a shopper to understand if a vehicle has the features that are of greatest interest to them and to compare price and features with comparable and competitive trims. This feature assessment and vehicle comparison module allows the visitor to determine feature value specific to their needs. In addition, the modules help Edmunds provide custom consideration sets for visitors. As Senior Creative Director, New Concepts I define product goals, test and determine data logic, conduct user testing, design and deliver a finished product. Examples include vehicle price, feature, location, volume, distance and availability. 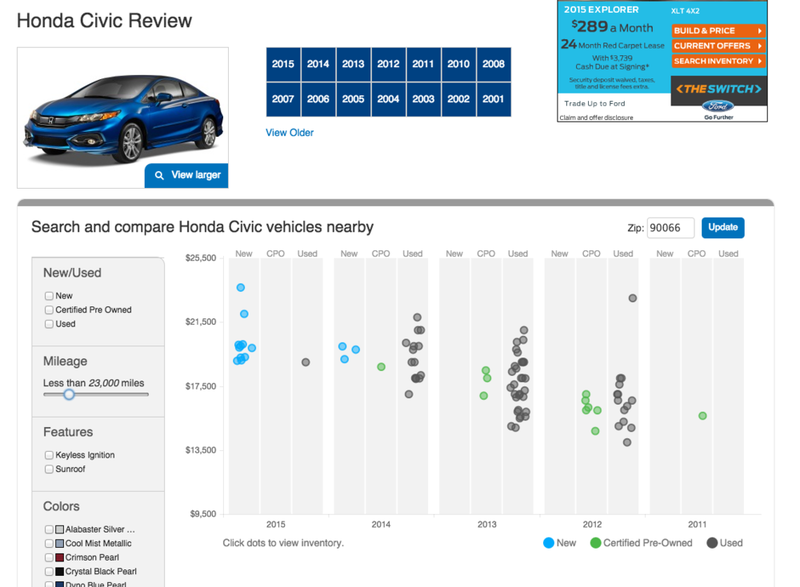 Each chart is custom, live content representing vehicles on a lot nearby. How is this information easily consumed? When is it overwhelming? How does the context play a part in the overall readability?